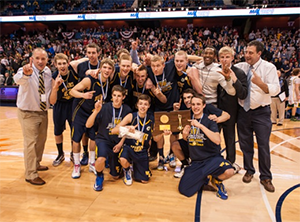 UNCASVILLE - It would be understandable before this season if people didn't put Woodstock Academy and state basketball contender in the same sentence. The Centaurs have rarely been a factor in the Eastern Connecticut Conference, let alone in a state tournament. But in the season opener back in December, they served notice by beating New London. And Woodstock Academy rarely stumbled since. The Centaurs' capped its dream season with its first state championship, upsetting top-ranked Trinity Catholic 52-49 for the Class L title at the Mohegan Sun Arena. "'Where's Woodstock?' I answered that question at the media day (Thursday), what, a half-dozen times?" Woodstock coach Greg Smith said. "Where is Woodstock? They'll know now." Ian Converse had a game-high 23 points along with 11 rebounds, for the Centaurs (25-3). He hit two free throws with 5.7 seconds left to put the Centaurs up by the final margin. After Schradac Casimir's deep 3-point shot missed the mark for Trinity Catholic, the on-court celebration began. "This year, everyone was passing. No one wanted to be a standout. Everyone did an incredible job," Converse said. Trinity Catholic, which was seeking its seventh state championship, finished at 25-3..
"I think they play a very good zone and I think they have good size inside," Trinity Catholic coach Mike Walsh said. "I think they forced us to take shots further out and we did at times. Converse was the only player in double figures for the Centaurs. Sullivan Gardner had a game-high 14 rebounds for Woodstock Academy. Tremaine Fraser led three Crusaders in double figures with 17 points. Fraser and Brandon Wheeler combined for 21 rebounds, but the Crusaders struggled mightily against Woodstock's 1-3-1 zone, shooting just 33.3 percent from the floor. "We don't really play against a lot of zones and whenever we did, they weren't as big (as the Centaurs)," Walsh said. "we could have been a little more patient at times, but we are a pretty good 3-point shooting team." Tristan Welch's 3-point shot put Woodstock up 49-43 with 3:24 left. Chris Lowry missed four straight free throws downs the stretch to keep Trinity alive. Wheeler had a chance to tie the game at 50 with 8.9 seconds left, but he missed his second free throw attempt. The tie-up on the rebound went to Woodstock Academy, eventually leading to Converse being fouled and draining the two free throws. "Three losses all season long by a grand total of five points," Smith said. Points in the paint-WOODAC 26,TRINITY 20. Points off turnovers-WOODAC 6,TRINITY 13. 2nd chance points-WOODAC 6,TRINITY 11. Fast break points-WOODAC 6,TRINITY 8. Bench points-WOODAC 3,TRINITY 2. Score tied-2 times. Lead changed-4 times. Last FG-WOODAC 4th-03:24, TRINITY 4th-01:11. Largest lead-WOODAC by 9 1st-00:46, TRINITY by 2 2nd-00:30. 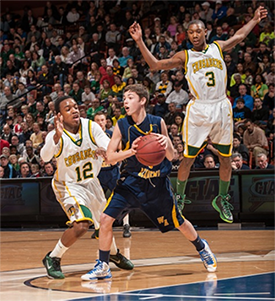 Technical fouls: Woodstock Academy-None. Trinity Catholic-None.